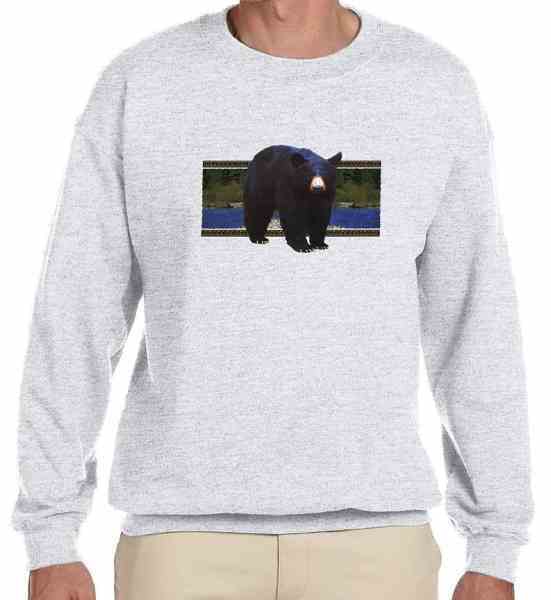 Black Bear River Cross Sweatshirt- This Black Bear Sweatshirt print comes in your choice of two colors and is under our wildlife and animal tee shirt section featuring the North American Black Bear. All our animal and wildlife Sweatshirts come in sizes up to a XL. The Black Bear is one of the most powerful animals in North America. This is a great Sweatshirt for anyone who loves bears. Our wildlife Sweatshirts are first quality tees, made of 50/50 cotton poly. If you have questions regarding our Black Bear River Sweatshirt or any other of our bear merchandise, please email us with the product name and number.